If you are in the DFW metroplex and need an idea for a unique place to visit for the day, try Lake Carolyn in Irving, Texas. This lake is in the heart of the Las Colinas Urban Center; walking distance to the restaurants on Las Colinas Blvd. and conveniently located near the new DART Orange rail line. If you’re looking to get get some exercise in, there is a 3-mile trail around the lake. 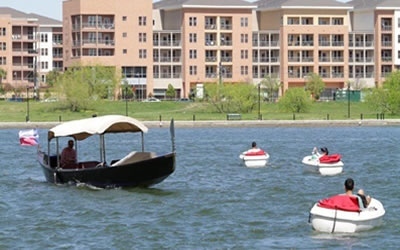 There are also gondola rides that feature evening dinner options and even pedal boats that you can rent! This area is developing rapidly! From high-rise condos and apartments to newly built lake-front homes, if you’re looking for a home that has both a city and suburban feel, you may want to check out Las Colinas! There are over 3,000 apartment units near Lake Carolyn, along with 14,000+ residences in Las Colinas and another 3,000+ planned or under construction in the area.